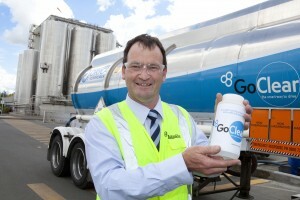 Terry Smith at the Fonterra Dairy Factory, Te Rapa, Hamilton, with a symbolic 2 millionth litre of GoClear. Farm nutrient company Ballance is continuing to tune up the transport industry with GoClear, an exhaust additive that reduces emissions, with production of the solution reaching 2 million litres this month since manufacturing commenced in 2010. GoClear is a high purity aqueous urea solution injected into the exhaust of diesel engines using Selective Catalytic Reduction (SCR) technology to reduce nitrogen oxide emissions by converting nitrogen oxide into harmless components of water vapour and nitrogen gas. Ballance makes GoClear at its ammonia-urea plant at Kapuni, Taranaki, and growth in demand for the product continues to accelerate. Ballance Process and Chemicals Manager Terry Smith says the company is alone in offering a “100% made in New Zealand” solution to reduce emissions. “Using urea from the country’s only plant of its kind, GoClear is made using all New Zealand resources and labour, which means all of the benefits remain here. As demand increases around the country, Ballance has forged distribution partnerships to make the product easily accessible. “The rapid growth in SCR truck numbers has seen a growing need for bulk installations,” says Dr Smith. In a New Zealand first, GoClear is now available to the public at McKeown Petroleum’s Gore and Oamaru fuel stops, and Z Sanson (as Z-DEC), and is coming soon to Z Mount Wellington and Caltex Bombay Hills. Further expansion of the network is underway with other major New Zealand fuel distributors. Dr Smith says a growing number of the national truck fleet is using SCR technology and New Zealand-based supply is important in minimising supply risk and delivery time for this product, which is now critical to our transport infrastructure. “Dependency on overseas manufacture of a similar product is a risk we can’t afford. Local manufacture and safe, efficient and economic distribution is the only logical way to provide the solution. Ballance and Orica have on-farm delivery systems available for filling tractors using SCR technology including New Holland, Claas, Case IH and Massey Fergusson. Farmers near Gore and Oamaru can buy directly from McKeown Petroleum’s fuel stops in smaller quantities.